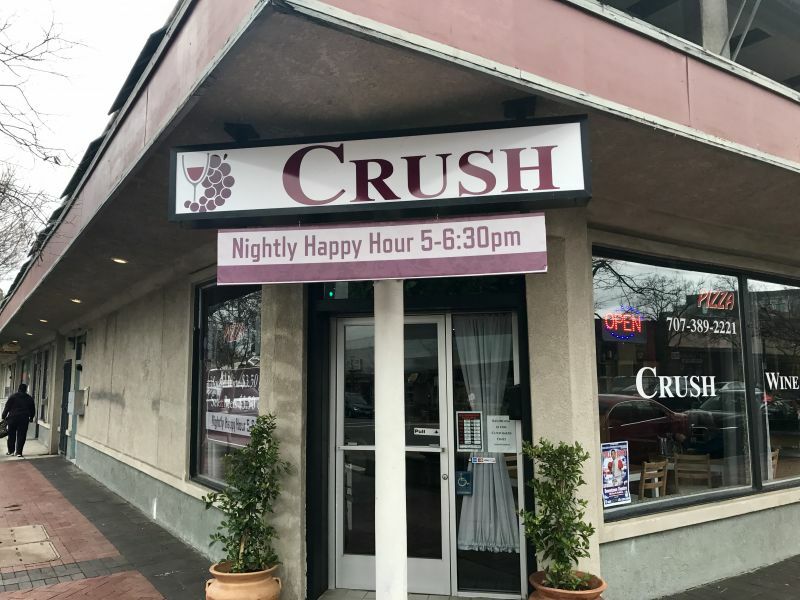 We have on several occasions complained at the lack of dining options in Fairfield; so I was excited when I saw that a wine-bar called Crush had opened. The recent storm and resulting flooding made us reluctant to drive far, so it seemed an ideal opportunity to have lunch at Crush. Crush is on a corner in the Downtown portion of Texas Street. There are a handful of tables and a long bar. 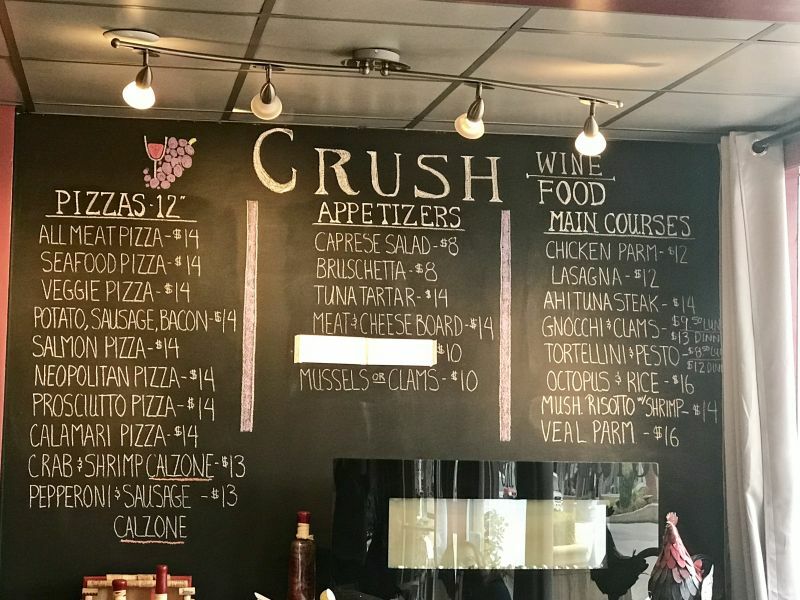 The menu is on a large chalkboard and consists of appetizers, pizzas, and entrees. There is no printed wine list, as they change their options frequently. You can see the bottles behind the bar, with the prices in chalk beneath them. Most of the wines are available by the glass. Several local wineries were represented; Wooden Valley, Seven Artisans, and BackRoads Vines. I went for the Seven Artisans Syrah. The first impression was a lush dark fruit blend of raspberry and blackberry, but they faded in the finish which was dominated by alcohol. A drinkable wine, but by no means a classic. At $7 a glass, I was satisfied by my selection. California Girl Comments: I opted to try one of their other wines that wasn’t local as I have had all of the local wines many times before. I was disappointed not to see some of my favorites offered like Vezer Family Vineyards and GV Cellars among their local wine selections. 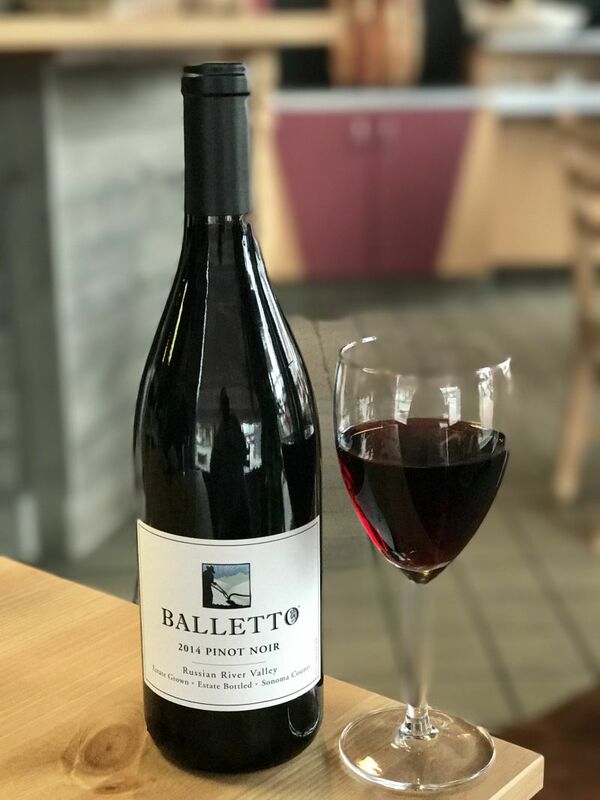 I ended up ordering a glass of a 2014 Russian River Valley Balletto Pinot Noir which was a good sip with lunch as it was not too heavy or bold to pair with the risotto. The wine was smooth with medium body and good acidity, though more of a plum flavor than the signature cherry flavor associated with Pinot Noir. 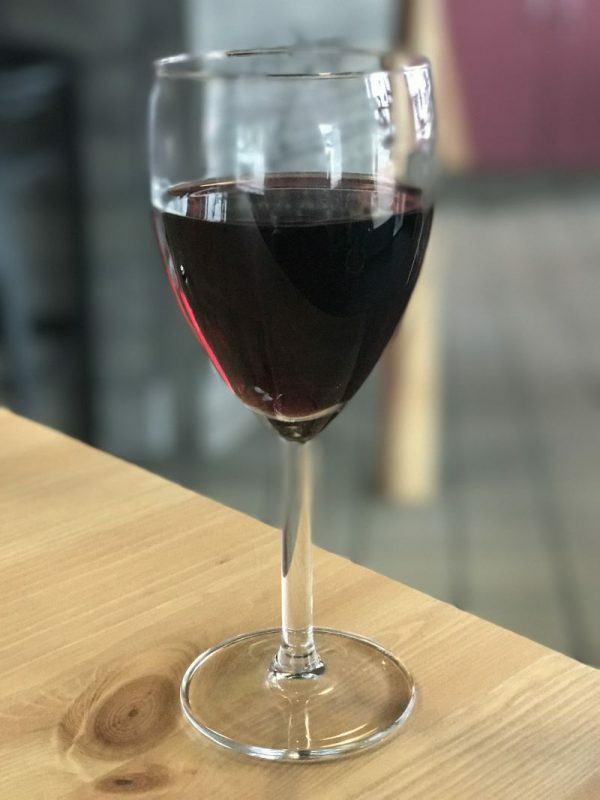 I enjoyed my glass with lunch and would recommend it as wine that is an easy drinker that pairs well with food. It was lunch, so we skipped starters and went straight for the main course. At the chef’s recommendation I ordered veal Parmesan. There were two pieces of meat on the plate, no pasta, and a small side salad. The meat was cooked well; flavourful and tender. The sauce was thinner the a traditional marinara, with an excellent tomato flavour and acidity that was an excellent complement to the meat. 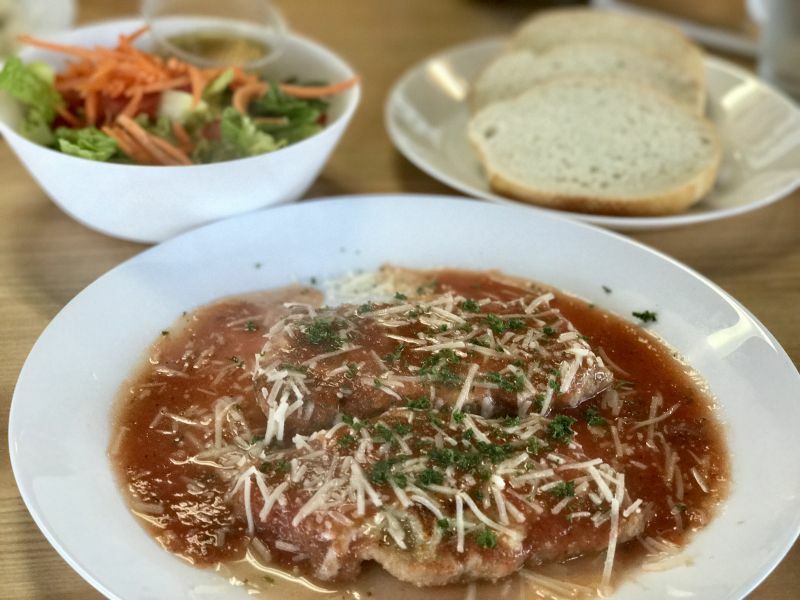 I do prefer my Veal Parmesan dishes to have a crispier coating, but this was an enjoyable dish. California Girl comments: I too wished the veal had been a bit crispier on the coating, but they had to get credit for the tenderness of the cook. The sauce was a little thin and watery as you can see by the plate, but it had good flavor. I was disappointed that the veal came with no pasta or vegetables which seemed a bit strange. My risotto didn’t come with a salad like the veal did. Luckily for me, The Brit doesn’t eat salad, so I ate his. 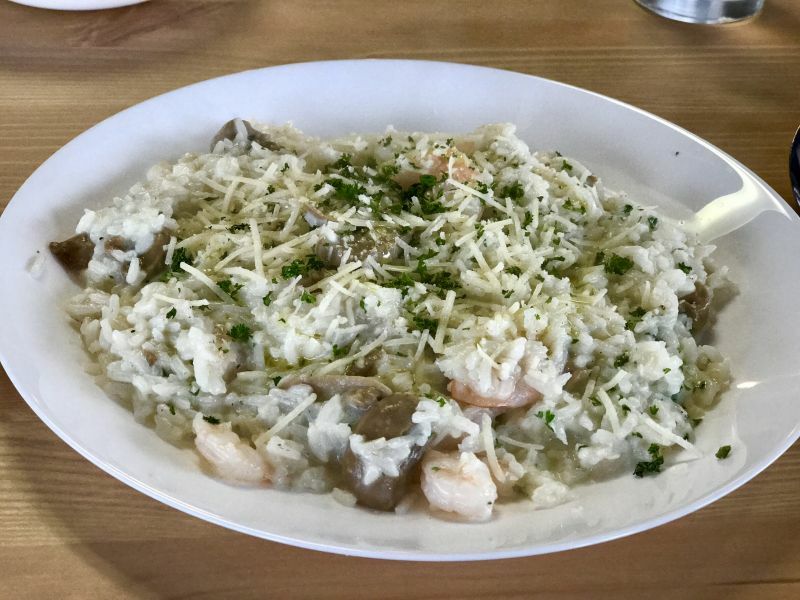 California Girl Comments: I ordered a dish of the Shrimp Risotto. The risotto had a creaminess to it, and the rice was nicely cooked. There were plenty of shrimp on my plate to make me feel satisfied. For me, the dish lacked a little seasoning. Still, it was good and I liked what I ate. Crush offers a single dessert, which they do not make on premise. On this day it was a chocolate fudge cake. 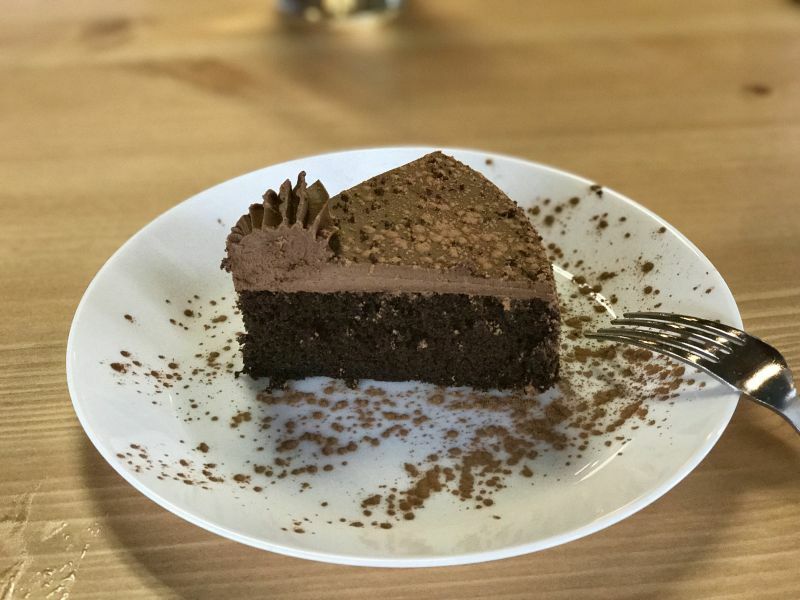 The texture was moist; my first impression of the frosting was that it was too sweet, but since, a single spoon of tasting from California Girl aside, I ate the helping, that was not a significant criticism. The cost of this dessert was a very reasonable $4. California Girl Comments: The fact that I had a single bite of the dessert shouldn’t give you the impression I didn’t enjoy it. Being a wine and food blogger is tough when it comes to overindulging so I try to keep it down to a low roar. (Sometimes unsuccessfully – ha!) The cake in fact was moist and had good flavor and texture to it. I also thought the frosting was a bit sweet, but hey, if something is going to be sweet it should be frosting right? 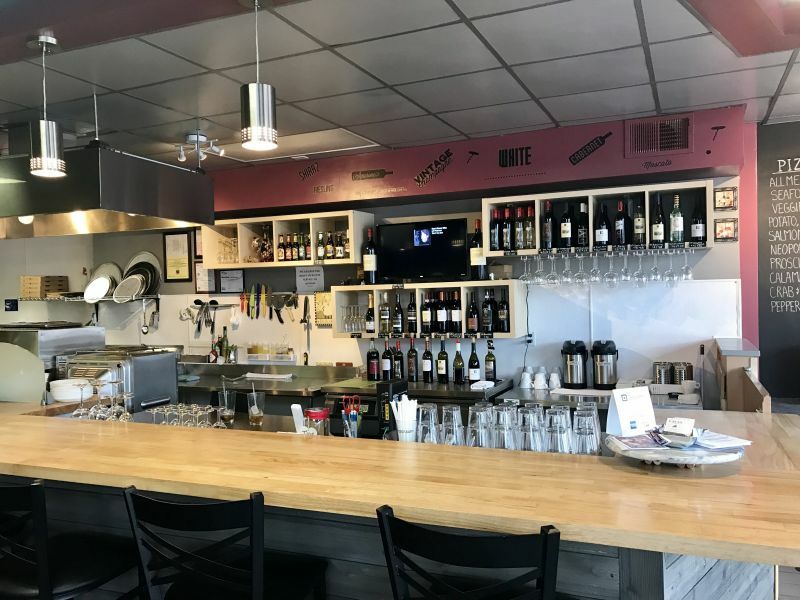 The chef and waitress; Francesco Pece and Heidi Burke are the owners. Their charm and enthusiasm enhanced our experience. Crush is closed on Sundays. They open for lunch Monday through Friday 11:30 to 2pm. Dinner is served 5pm to 9pm, starting with a Happy Hour offering house wine at $3.50 a glass. California Girl comments: We give Crush a good rating and encourage you to stop by and support our new local restaurant and wine bar. I look forward to going back and trying out some of their pizza’s and other offerings in the near future.